Step1: Upload your GenBank formatted file or FASTA DNA sequence file, or input an accession or GI number. Step2: Press the "Submit" button. The following page will be shown. Step3: Once the file upload has been completed, the following page will be shown as below. Step4: The final result will appear in 2-5 minutes. You can use any html request tool from Windows or Linux or Mac, such as wget, to conncect to our server using the above URLAPIs. For example, use 'wget "http://phast.wishartlab.com/cgi-bin/phage_command_line.cgi?acc=NC_000913" -O <Ouput_file_name>' in Linux or Mac. Our URLAPI can only handle single submissions at a time. It will not work for multiple raw DNA sequences in one input file, multiple ACCESSION numbers or GI numbers in one input file, or mutilple GenBank format files in a single input file. 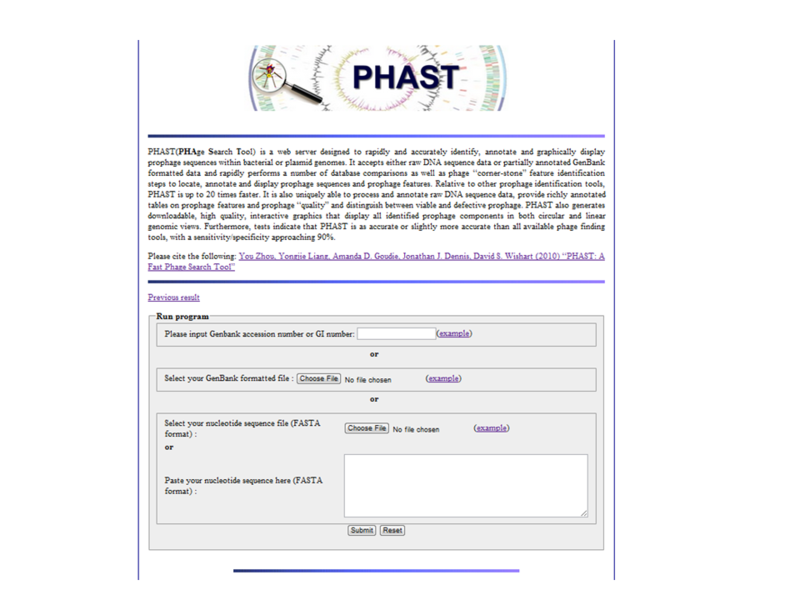 PHAST's URLAPI will return 4 possible outputs. Query failed for <your input>. The query is running for <user_input>. Please wait for a few minutes. Please check the following files after the time. The query for <user_input> is submitted to queue. When the query is completed depends on the server load. Normally your case will finish in 5 minutes to one hour. Please check the following files for your case after the time. PHAST server only supports two types of batch job modes. 1. Submit gbk file in the following format in home page of PHAST server. .zip and .gz formats are not acceptable. The line '//' is the important sign for the server's parser to split the gbk file into pieces. You can cancatenate many of them you want. 2. 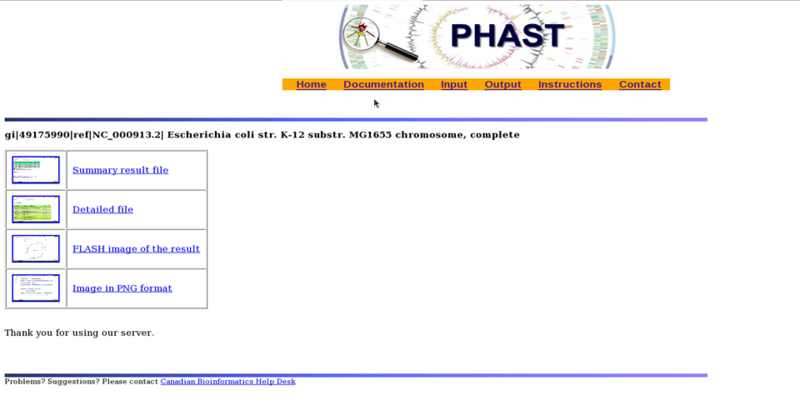 Submit fna file in the following format in home phage of PHAST server. .zip and .gz formats are not acceptable. THe character '>' is the important sign for spliting the fna file into pieces by the server's parser. You can concatenate many of them you want. 3. For batch mode of submitting accession numbers or GI numbers. PHAST server's home page does not offer this function. You can write your own program with the URLAPI mentioned above to achieve the batch job function.